The 2018 cross country season is just on the horizon and to predict the top individuals and teams this season, I'm releasing watchlists for each category. To get a fuller picture of how returning athletes might fare this year, I used lists of the Top Returning Boys 5K Teams, the Top Returning Boys Teams for 3200m, and the Top Returning Boys Teams for 1600m, and the Top Returning Boys Teams for 800m to rank athletes based on consistent performances over the past year. We continue with Division IV Boys Teams and are working down to Division I Boys Teams. *Special Note: Please understand that these previews are meant only to profile some of the top teams and athletes in each class and are by no means as a way of excluding certain teams/athletes for any reason. Civil discussions on subjective rankings are encouraged and embraced. Comment with anyone you think we left out and please send any private questions, comments or concerns to igaribaldi@milesplit.com. In the Division IV Boys race at the State Championships last year, we witnessed the Hopi Bruins suffer their first loss in 28 years. The question on everyone's mind this season will be, 'How do they rebound from that loss?' 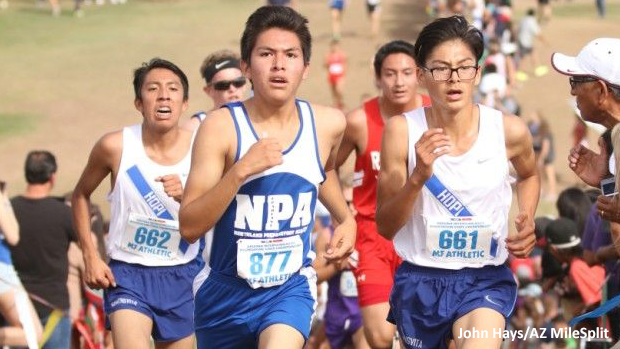 Hopi return with each of their scoring varsity from last year, and although Northland Prep graduated one from their top five they'll have the man power to repeat for a State Title. Check out the other boys teams aiming for top-ten finishes at Cave Creek Golf Course this November in our subjective list of Division IV Boys Teams to watch over the 2018 cross-country season beginning with a few honorable mentions and counting down to our top pick.